I really enjoy being a member of the various online book communities that I’m a part of, much as they are largely responsible for my enormous TBR pile and wishlist. I know I can find opinions on everything from the latest popular bestseller to obscure novels which I’d never have discovered on my own on GoodReads, LibraryThing and the various blogs I read. On this particular occasion it was LibraryThing which came up trumps when a few months ago it was pointed out that Amazon was offering pre-order copies of the newest Persephone The Sack of Bath by Adam Fergusson, for only £1. Having investigated the title it seemed a little outside of what I would expect from a Persephone book, but a £1 Persephone is not something that I’m able to turn down, so I ordered it regardless. I picked it up off the shelf to read recently because it was small and portable. The Sack of Bath was written in 1973 in response to the decisions made by Bath City Council to demolish large swathes of Georgian cottages in order to provide the city with newer houses, better access and improved facilities. Fergusson acknowledges that the aim itself was admirable but the ways in which they sought to accomplish it were misguided. With words and pictures he illustrates the ongoing destruction of Bath and issues a heartfelt plea for it to be stopped and more reasonable measures, such as renovation and preservation, be considered instead. Although The Sack of Bath is just as well written today as it was when it was first published, it lacks the immediacy which it would have had in the 1970′s when the demolition and construction was being carried out. It is interesting, yes, but in a vague and distant way rather than in an inciting-architectural-rage-and-writing-to-your-local-MP-to-stop-this-sort-of-thing way that I suspect it was intended. The closest thing that I can liken it to is reading a newspaper article covering some terrible natural disaster and trying to encourage readers to give aid, but doing so nearly forty years after the event when everyone appears to have recovered quite nicely, thank you very much. It just isn’t the same as reading it when it was relevant. The problem is that the book is written in such hyperbolic language and strident tones that it implies nothing less than the wholesale destruction of historic Bath, which couldn’t be more different to what any visitor to Bath today will see as they walk around the city. In fact, the most recent new development is incredibly sympathetic to the aesthetics of the city and blends in beautifully (or as beautifully as modern high street shops ever could) with the historical setting. Admittedly this is probably at least in part due to the pressure of action such as the publication of The Sack of Bath but there is such a huge gap between this and the city overrun with hideous concrete boxes that you might expect from reading the book that it lost a lot of impact for me. Clearly this book was influential in its time and I have no doubt that it did a lot of good, but I didn’t find that it quite worked reading it now. 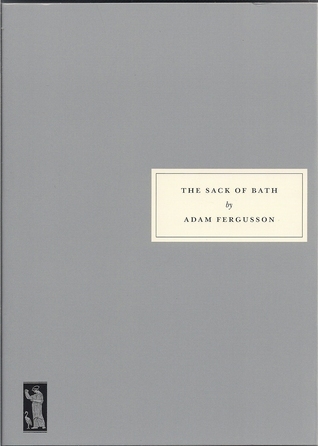 The Sack of Bath by Adam Fergusson. Published by Persephone, 2010, pp. 81. Originally published in 1973.